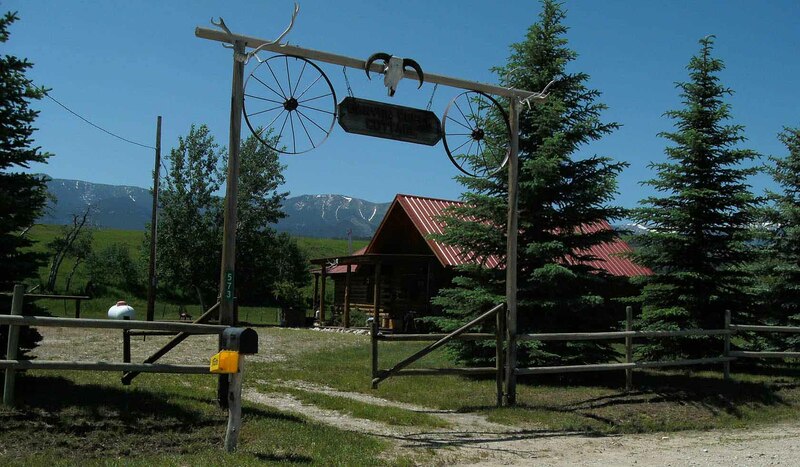 Canyon Creek Cottage Cabin Rentals is a 3 -acre mountain setting below the majestic Beartooth Mountains, outside Red Lodge Montana, only a few hours drive away from the famous Yellowstone Park. The property includes a main cabin (sleeping 6 adults), a smaller cabin (sleeping 2-only available as an "add-on" when main cabin is rented), a horse barn and corral, an authentic working outhouse for those who might choose to "rough it", a pond stocked with trout, and a meadow area complete with a hammock hung between huge Aspen trees. A running, mountain stream surrounds the property with several small waterfalls, perfect for wading at many points. Mountains, trees, small hiking hills grace the scenery. The immediate area around the cabins is grassed with pine and blue spruce trees providing privacy. Both cabins are authentic log cabins. The main cabin is configured with a dining area, fully-equipped kitchen, living room and two bedrooms, a bathroom with shower. Main cabin kitchen is kept stocked with staples and basic needs. Refrigerator holds condiments, dressings, jellies, syrups, etc. Stove/oven and microwave complete this working kitchen. All needed utensils and dishes are provided, including linens. Wildlife sightings on the property include: deer, moose, mountain lion, rabbits, raccoons, gray fox, skunk, eagles, cranes, ducks, wild turkeys, and many varieties of wild birds. Cabin is open year-round. Perfect for relaxation as well as recreation. Child-friendly with toy boxes and trunk of board games, large library of movies and books. Come stay at our place.... you'll only be sorry you didn't plan to stay longer!!! !